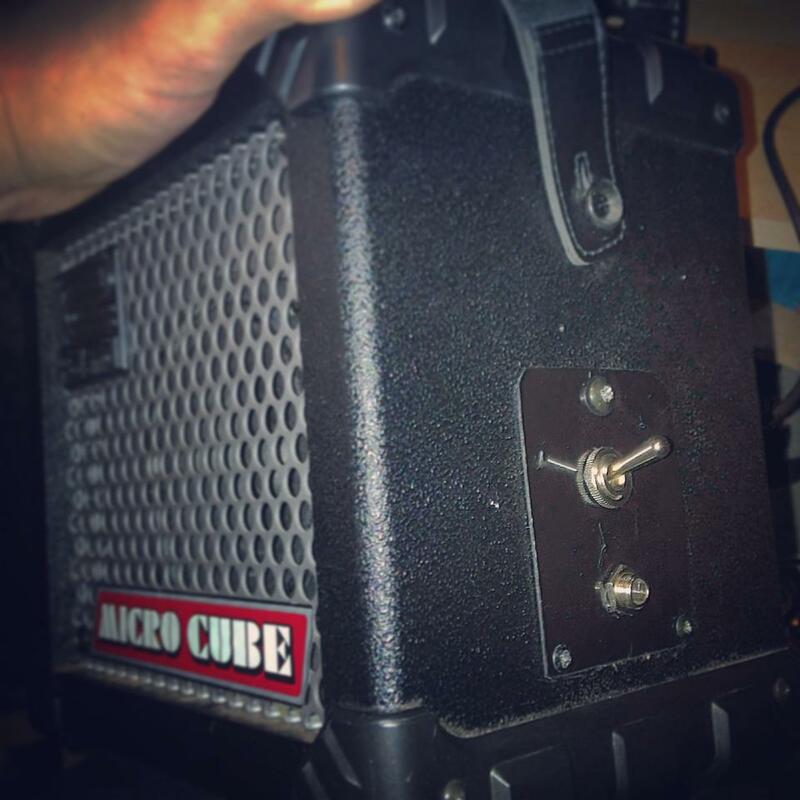 I made a simple combo guitar amp mod today… I added a switch and a speaker out to Roland MicroCube, but this same technique can be used for almost any combo amp. The idea of the mod is that you can swap between the internal 5″ speaker (that sounds like a bum hole) and any cabinet you want on the fly just by flipping the switch. Took way longer to execute than I want to admit because my tools totally failed on me (I need to buy a new head for my soldering iron) and I just winged the whole thing, but basically you just need a jack, switch and some cable to do this and something to mount the thing to. Do NOT do this if you have no clue what you are doing. I do not take any responsibility if you ruin/destroy your amp, kill yourself or burn your house down. And don’t be an idiot and do this while the amp is connected to a power source or while any potential tubes are hot. Disconnect it, let it cool down and then proceed. Step 1: Remove the grille from the front of the amp and remove the speaker with the screws that it’s mounted. Then get about 1ft the same gauge wire that is used in the amp. Use wire cutters and cut the wire from the amp to the speaker about half way OR so that you just remove it from the speaker side and add new cables there. Note that the wire from the Micro Cube amp to the speaker is REALLY short, so you most likely need to extend them a bit. Step 2: Get a mono guitar jack and an On-On switch and use a multimeter to find out how they are routed if you have no idea. Usually the switch is routed so that the input is in the center and the variable outputs are in the sides. Jack is always so tip is plus and ring is ground. You can solder the jack to the switch already, but don’t solder the speaker or the amp in there yet. Step 3: Mount the jack and switch to something that you can then attach to the amp. I used a small piece of plastic that I cut out from an old DVD case. It’s a bit flimsy, but much better alternative than the cardboard that I originally intended to use. Step 4: Make a hole to the side of the amp, that can fit the switch and the jack. To be honest, this was possibly the hardest part of this mod, because I didn’t have the right tools for the job. I used my screw driver with a drill bit and the saw blade on my Leatherman to make the square hole. If you have a dremel, jigsaw or something, I bet that you can do it much faster with those.